Nokias N900 cellular phone is a location aware device. Usually it has been able to display your location in the status message of instant messaging services like Jabber or Skype. This function has stopped working completely some time ago. This article describes the underlying problem and presents a fix to restore the function again. Thus there is a problem with the request sent to Nokias web service. 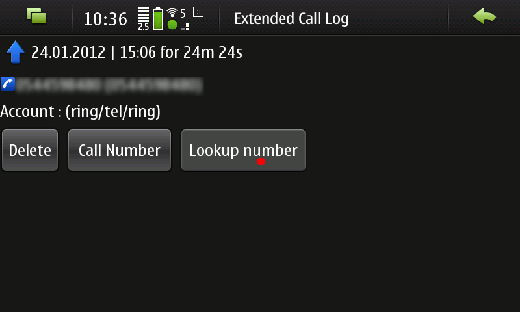 Most probably Nokia has changed the web service in the meanwhile. However, using the same request without the token leads to the desired result. This can be easily tried out by entering the requests URL in a web browser. Unfortunately nm-nav-provider is closed source, so it cannot easily be modified. 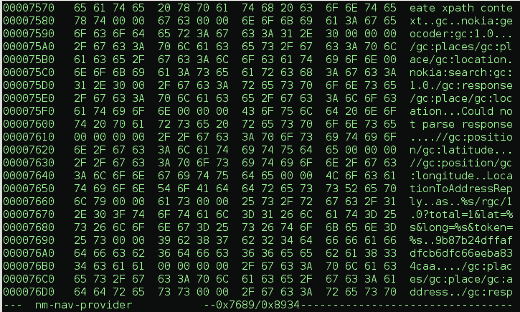 A hex editor can be used to search for the token string and then the request can be zero terminated in front of it. There are two positions with a matching request in the 0.109-3+0m5 version of nm-nav-provider, one at position 0x73F7 and one at 0x7689. The latter is the relevant one for the problem. Replacing the byte at this address by a zero terminates the request string and leads to a request that can be understood by Nokias web service. One has to kill the nm-nav-provider process before being able to write to the file. 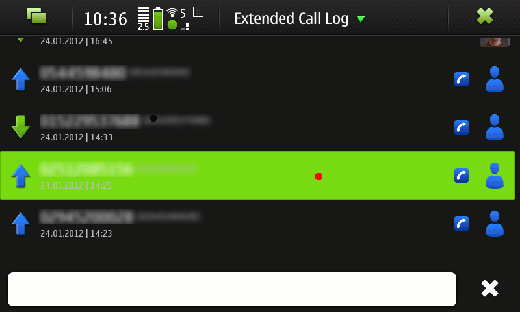 This line works for nokiamaps-navigation-provider-0.109-3+0m5. 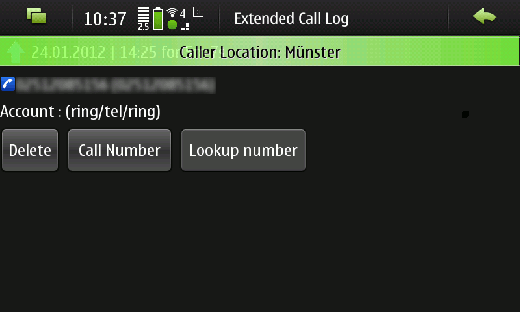 After execution, the location can be published to contacts again. The only problem remaining is up to you. Do you really want that all your contacts know your location? I’ve tested meego SR on my N900 and it looks great. There are only problems with my german keyboard layout left, but with onscreen keyboard everything works fine. Next I will check connecting it to anything, I’ve connected maemo to. The installation documentation is here and it simply works. If you have a pr1.3 kernel, you only need to install uboot. Originally it can boot from a fat partition of any sd card inserted. If you want to switch back, you have only to remove the sd card. For testing it is easy. You will find more info’s on meego.com. A short list of release notes can be found here. The MeeGo Project has released the version 1.1 for Intel Atom and ARMv7 for Download. MeeGo is the fusion of Intels Netbook OS Moblin and Nokias Maemo. The new Linux distribution is available with three different Desktops. The Version User Experience (UX) for Netbooks uses the well known GTK Interface of the Moblin distribution. The variant for In-Vehicle Infotainment (IVI) is optimized for in car use. 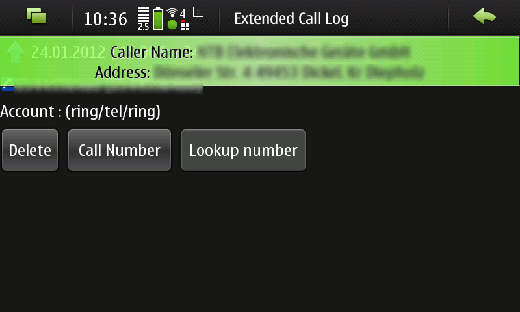 The third variant Handset UX is designed for use with mobile phones and internet tablets. Handset UX should work on N900 Nokia mobile phones and is planned to be installed on the new N9 instead of Symbian-OS. Maemo 5 PR1.3 was released on October 25, 2010, together with an update of the SDK for developers. The product version is 20.2010.36-2. Qt Mobility API 1.0.2, which is now integrated into the device software. Qt Core libraries updated to 4.7.0 version.